Irrigation and Fittings. > Can be attached to 3/4"(19mm) tap or faucet. Portable 4 Tiers Mini Greenhouse Outdoor Plants Hot Green House Garderning Yard. Portable Mini Greenhouse Plants Outdoor Yard Hot 2 Zipper Doors Green House. 8 outlet surge protector. 4 outlets controlled by mechanical timer with 15 minute on/off increments. 5’ cord. 15 amp max load. 120V. By: Ace Hardware. Buy 4 and save! Easy to Use. Not for Use on Appliances. 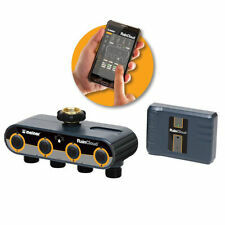 RainMatic 3000 Electronic Water Timer Programs 8 On/Fff Cycles Per Day . Condition is New. Shipped with USPS Priority Mail. • REVEIW PICTURES FOR SIZES, CONDITION, & WHAT IS INCLUDED IN THIS SALE. Dig Digital Battery Powered Hose End Timer 3/4"FHT x 3/4"MHT B09DB New!!! This Is New And Unused! - INLET 3/4" FEMALE HOSE THREAD WITH SCREEN FILTER WASHER. - UP TO ONE YEAR BATTERY LIFE WITH ONE 9V BATTERY (NOT INCLUDED). - OUTLET 3/4" MALE HOSE THREAD. - FULL FLOW UP TO 8 GPM. 3.5 out of 5 stars - Dig Digital Battery Powered Hose End Timer 3/4"FHT x 3/4"MHT B09DB New!!! 8 product ratings8 product ratings - Dig Digital Battery Powered Hose End Timer 3/4"FHT x 3/4"MHT B09DB New!!! MyGuard Automatic Laundry Water Shut-Off System for Washing Machine. Condition is New. Shipped with USPS Priority Mail. Brand new Rainbird Sprinkler Timer. Never been used before (aside to test it)!! No packaging included because this item came in a sprinkler system. Item is available to ship immediately. Irrigation and Fittings. The service life of solenoid valve is longer than ball valve. In general, solenoid valve will work above 1 year. The power consumption of solenoid valve is lower than ball valve. Irrigation and Fittings. Gardeen Tool. We want to make your garden life wonderful. Endding Soon. We will not bear the back freight if it is not the problem of product quality. > No battery required. Irrigation and Fittings. > Ideal for Professional irrigation for golf course, garden, lawn, farm. Gardeen Tool. We want to make your garden life wonderful. We will not bear the back freight if it is not the problem of product quality. > Manual watering available. > StrongBall valve inside( inner size: 8mm). We want to make your garden life wonderful. > Can be attached to 3/4"(19mm) tap or faucet. We will not bear the back freight if it is not the problem of product quality. Specification: Material:ABS Color:Green Size:approx.17.5 * 13 * 8CM Working pressure: 0.0-8 kg Power supply: 3V, AA batteries(not included) Suitable water temperature: 0-40 degrees Celsius Water cycle: cycle time is 6 hours, 12 hours, 1 day. 2 days ..... The longest cycle period is 7 days. Description: Rotate the dial to set the corresponding program according to your individual needs. 1. Use two 1.5 volt 5 alkaline batteries; 2. 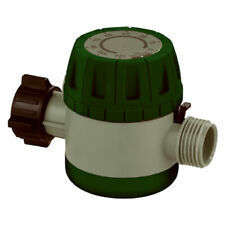 Suitable for 0-8 kg water pressure; 3. Suitable for water temperature 0 ℃ -40 ℃; 4. 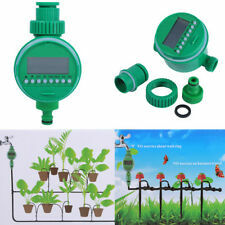 Can set the specific watering time, and can set the current specific time; 5. Full waterproof function. (Can be used outdoors) 6. There is a temporary watering function (does not affect the set of good procedures) Package included: 1 Pc Watering timer 1*User Manner. 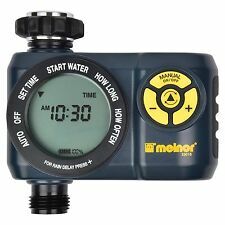 NELSON 5200 RAIN DATE Automatic Hose Water Saver Shut Off Timer Control Valve; new. Set from 3 hours to 30 minutes of watering. Shuts water off automatically. Rugged plastic with brass coupling. Compact unit swivels on faucet for easy access to controls. No wiring, no batteries necessary. Easy to Set and Use. Has 2 programmable and 1 manual Outlets. Irrigation and Fittings. > Can be attached to 3/4"(19mm) tap or faucet. Motion Sensor Repellent Ultrasonic Outdoor Animal Repeller Garden Dual Speaker. 2016 Four-Way Out Water Distributor Valves Garden/Yard Tap/Hose Pipe Fittings. 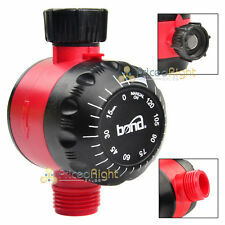 Automatic Mechanical Water Timer Garden Hose Sprinkler Irrigation Controller. This item belong to me personally, and I only used it once, it's practically new! Fits any standard 5/8" garden hose. Please inspect photos carefully prior to purchase. Check photo of Dale for details. Features include: Metered Flow Time (up to 4-1/2 hours), Metered Number of Gallons (up to 14 gallons), Continuous Flow, -OR- Off. Our Internet-connected irrigation valve automatically adjusts your plants' watering schedule so that they are always healthy and beautiful, using just the right amount of water by watching your local weather.